Many of my readers have been asking me for years about the possible nutrient loss in cut fruits and vegetables. 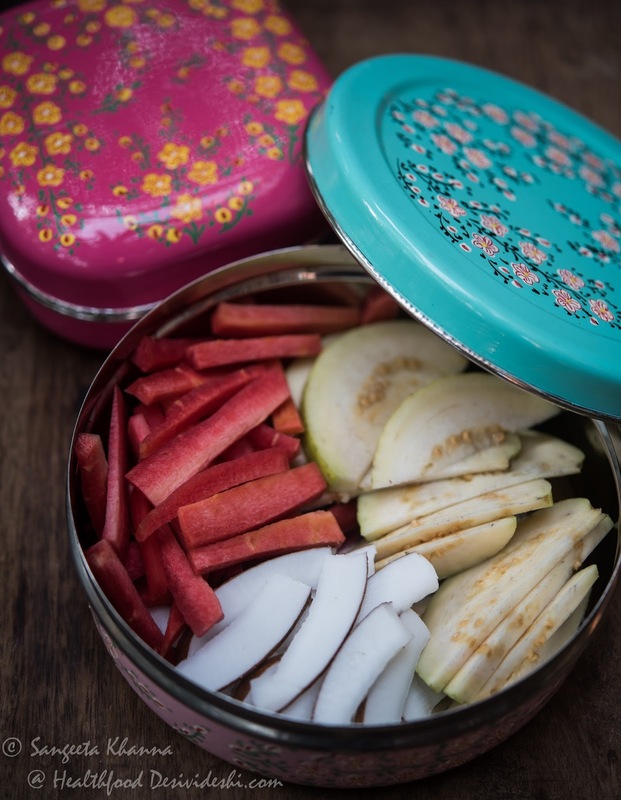 I have been packing cut fruits and vegetables in lunch box for years and even get vegetables chopped for making our curries well in advance sometimes. I had once come across a study that claimed that the nutrients are preserved better when they are frozen but that may feel like a marketing ploy by frozen food companies in the west. For cut fruits and vegetables to be consumed within a few hours everyday the nutrients are preserved pretty well. A study in 2006 suggests that there is insignificant nutrient loss when we cut the vegetables and fruits to be consumed after a few hours. See this to understand better. Honestly speaking, I would prefer packing cut fruit in my lunch box for the simple reason that if I pack a whole apple and a whole papaya, cantaloupe or even mosambi (sweet lime) I wont feel like eating it in the busy work schedule. If I cut them and pack them with a fork, I would eat it regularly. So even if there is a 5-10% nutrient loss I will not mind that. However we must take care to cut and pack the fruits and vegetables in such a way that the nutrient loss is minimal. Articles have been written about the perfect way to chop fruits and vegetables too. The oxidation of nutrients in fresh produce also depends on how they have been handled during transport from the farm to your table, so choose your fruits and vegetables well when you buy. Considering all the concerns above, I would list a few precautions and the right way to chop and store fruits and vegetables if you plan to eat them within a few hours. 1. Be careful when you buy fruits and vegetables. Already overripe and damaged fresh produce wouldn't keep well after chopping. So use the overly mature and slightly damaged produce of cooking or for immediate consumption. It is not a good idea to store them even in uncut form. 2. Ensure a clean dry chopping board to chop the fruits and vegetables you are planning to pack in lunch box. Chopping boards are known to transmit E. Coli and Listeria innocua, especially where raw food is handled in bulk amounts. You wouldn't want upset stomach after eating raw foods. 3. Use a clean dry and sharp knife to chop. While cleanliness of the knife is to be ensured for the same reason as above, keeping the knife sharp is to minimize damage to the fruit and vegetables being chopped. More damage to the cells means more oxidization during storage. 4. Use clean, dry, opaque and airtight boxes to store and carry cut fruits and vegetables. Exposure to sun and air fastens the process of oxidization. 5. Sterilize your storage boxes or lunch boxes, chopping boards and knives properly at suitable intervals. 6. Use a salad dressing to prevent nutrient loss from some of the cut fruits and vegetables. The acidic oily dressings ensure preserving the nutrients better and even help in better absorption of nutrients as well. 7. Hand tearing of lettuce and surface peeling of carrots is reported to be relatively free of bacterial contamination. The naturally torn surface of fresh produce cause minimal damage to the cells and it doesn't support bacteria growth. 8. Keeping the cut fruit chilled helps a lot. Do not pack cut fruits if you have to keep the lunch box in a hot place or in a car that is parked in the sun. 9. If mixing raw leafy greens or chopped onion, tomatoes etc to chickpea or black eyed peas salads, take care to cool down the cooked beans first and then mix with raw ingredients. It helps retain the texture and freshness of raw ingredients and prevents any unwanted fermentation or bacterial or fungal growth too. 10. Try pairing carrot sticks or raw broccoli etc with interesting dips or hummus so you don't get bored of eating healthy. 11. Local and seasonal produce is more likely to be fresh and retains its nutrients better. Try and include only locally grown fruits and vegetables generally and for cut salads too. We can depend fruits and vegetables grown within the country if not within the town. 12. The lunch box should be made of nonreactive material. This is a commonsense and I really don't need to enlist it since most of us use lunch boxes made of either stainless steel or good quality nonreactive plastic, but do remember that all plastic is not nonreactive and most plastic lunch boxes can be harmful when they are used for deep freezing and reheating in microwave ovens. It is better to pack food that can be eaten at room temperature. Reheating should be done for a really brief spurt of time if needed, dry food should not be reheated in MW ovens and too much reheating should be avoided absolutely. 13. The lunch box should be non abrasive material, and non abrasive cleaning devises should be used if using good quality plastic lunch boxes. 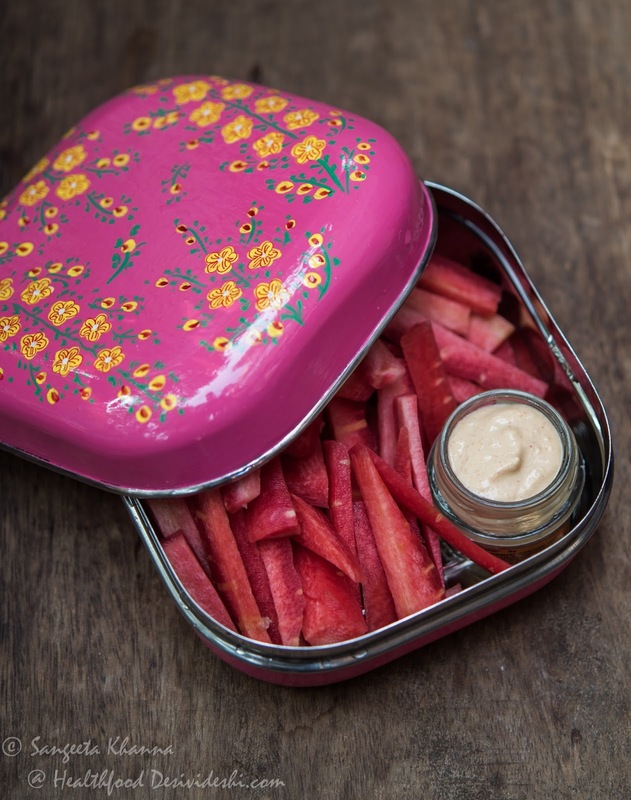 If the lunch boxes get abrasion on the inner surface it helps breed pathogens, fungi and bacteria and any raw food kept in them is not safe for consumption. Liquid detergents and a soft brush is good to clean plastic (Tupperware) lunch boxes. 14. Adding chopped nuts and seeds to chopped salads ensures the lunch box meal is filling and nutritious both. Same applies if you include a peanut butter or tahini based dip with carrot sticks or broccoli etc. 15. Sprouts make great raw and fuss free lunch box salads so keep including them to your chopped salads if you don't want to spend much time on assembling the lunch boxes. 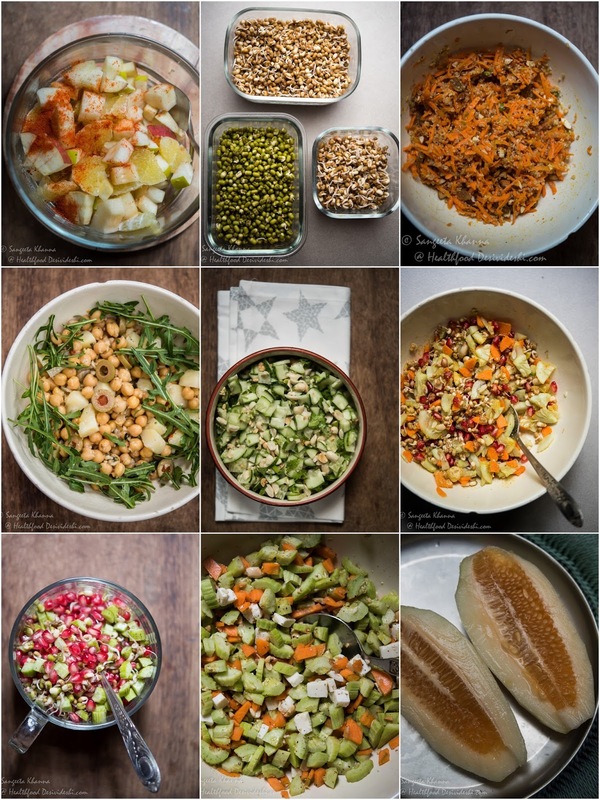 Pomegranate seeds are great additions to such salads. 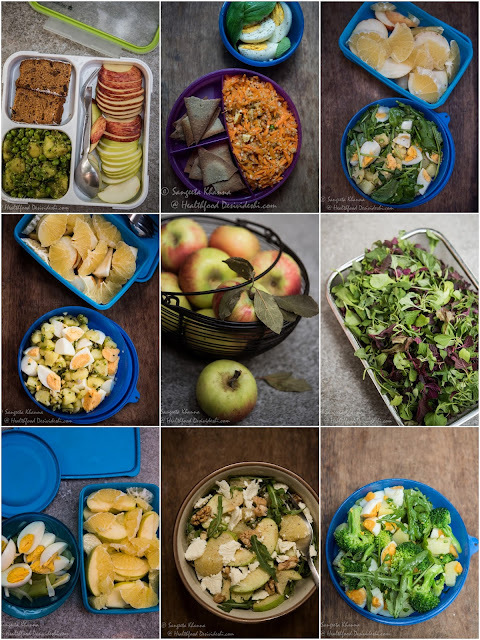 I will be sharing a few more useful posts about packing healthy lunch boxes after this, there are a few exciting giveaways too so stay tunes and comment on all these posts sharing your concerns and experiences. It is a series of 4 blogposts and comments on each post will be eligible to enter the giveaway. Keep commenting and enter a chance to win a useful set of lunch boxes. Share your ideas about how you pack fruits and raw vegetables in lunch boxes, how you like them and what precautions you take while packing such lunch boxes. Don't forget to provide your mail id if you are entering the giveaway. Informative post... I always like to pack cucumbers, carrot, sweetlime and apples, papaya with pomegranate for fruit/salad lunch for us or for kids snack. I like to use the fruits or vegetables directly from fridge and cut it and pack it, So after few hours it comes to normal temperature and fit to be eaten. For kids cutting in bite sized pieces and packing with some decorative toothpicks has always worked for me. I usually do this while travelling with kids to ensure they can eat by themselves having separate boxes in their backpacks. Thank you again for the very useful tips Sangeeta, please keep up the good work. 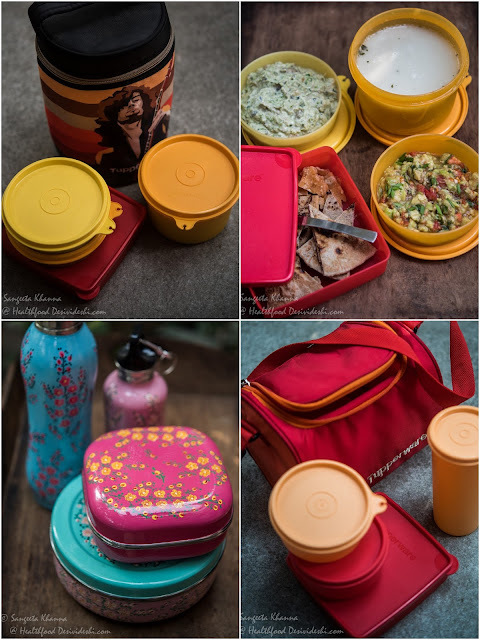 Looking forward to more such posts - weekly menus, shopping lists(:D)lunch boxes for kids, make ahead tips to help ease the morning school rush would be very much appreciated too! One thing you said here is so true. Even if I carry an Orange or Apple for my evening snack, it would invariably return with me as it is. But if I peeled it or cut it in pieces, I would eventually end up eating those. This article is good and also promotes inclusion of fruits in our diets as most of us tend to neglect it on the weekdays. Thanks for sharing so many tips. Really useful as I regularly pack fruits for my family. Great Post ! I would definitely like to enter for the giveaway. I want to know how to pack papaya as it get soft when cut and packed and I don't feel like eating them...what's your suggestion? Dear Sangeeta, this post was so very useful to me. I have already tried two items from here. After starting the regime, cooking seems so much light and easy All thanks to you. And yes, I would love to get the tiffin box. Sangeeta, i usually stick with hard variety of pear and apples, cut into quarters for lunch box, sometime i sprinkle little lemon juice on the cut pieces to avoid oxidation. Also cantaloups, grapes, carrots are gud for carrying in the lunch box and in case of oranges i just peel and keep it whole in kids lunches. oh...where did my comment go...i guess it's lost...anyways i mentioned that I like to give hard variety of fruits in packed lunches...apples, hard pear, grapes, cantaloupe, oranges....and yes if it's already cut/peeled more chances it will get eaten. Sometime I also sprinkle little lemon juice on certain cut fruits to avoid oxidatioan.